Terriers, who finished the 2016-17 season ranked #6, go into the new campaign ranked #2 in both the USCHO Weekly Poll and the USA Today/ USA Hockey Magazine poll. Defending champion Denver, who will visit Agganis Arena on Oct. 27, holds the top spot in both polls. Minnesota and Harvard are #3 and #4 respectively in both polls. Lowell rounds out the top five in the USCHO poll while Providence is #5 in the USA Today/ USA Hockey Magazine poll. 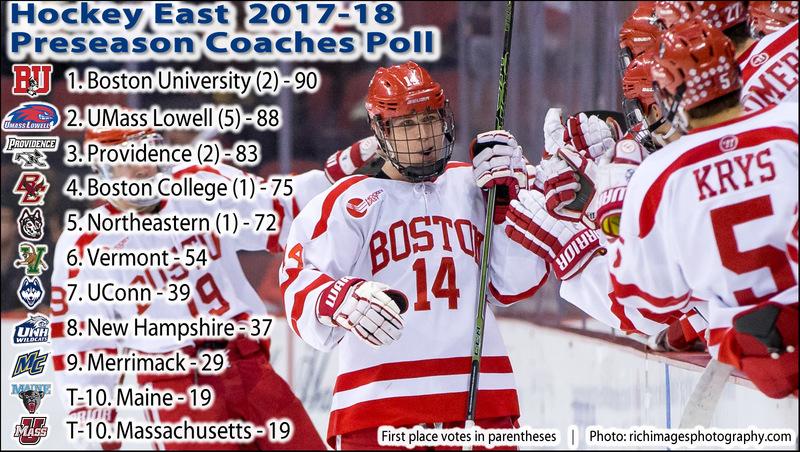 The Hockey East Preseason Coaches Poll , announced during Media Day, finds the Terriers ranked #1, followed by UMass-Lowell, Providence, Boston College and Northeastern. However, Lowell received the most first-place votes with five, while BU and Providence each received two. With league membership reduced to eleven following Notre Dame's departure, Hockey East also announced that this season's playoff format will be a return to the format last used in 2014. All 11 teams will once again make the playoff tournament. The five highest seeds will all receive byes into the quarterfinal round, while seeds four and five will be guaranteed to play each other at the higher seed's arena on the second weekend of the playoffs. Seeds six, seven, and eight will host seeds nine, 10, and 11 in the opening round, March 2-4. The three winning teams will then be reseeded and travel to the top three seeds for quarterfinal match ups, March 9-11. CHN's Mike McMahon, at Media Day, tweeted: "As for league TV, no deal announced. Many teams are working individual deals with NESN and/or ESPN3." ► New Hampshire has joined BU, Vermont, Maine and Northeastern as teams who live stream home games at no cost. 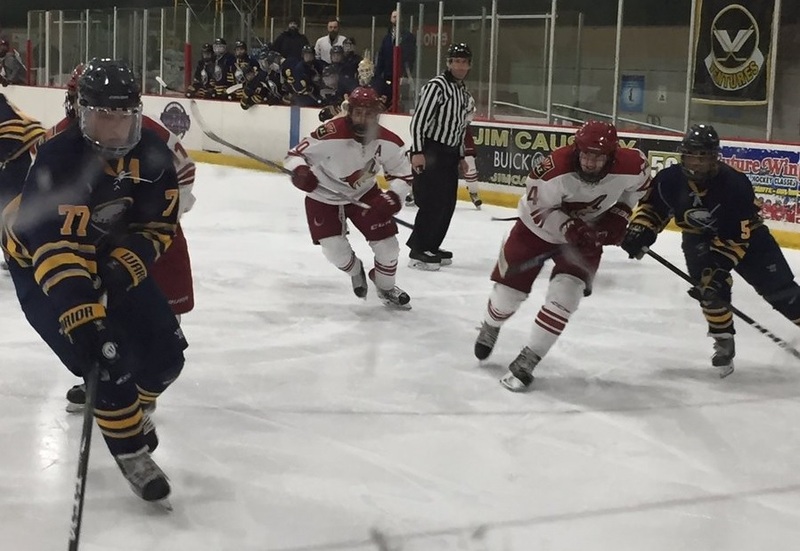 College Hockey Inc. has posted preseason polls for all six Division 1 hockey conferences. BU's rigorous out-of-conference schedule includes match-ups with the top ranked teams in the NCHC (Denver: home-Oct. 27), the WCHA (Minnesota St.: home-Oct. 13 & 14) and the ECAC (Harvard: BP-Feb. 5) , as well as three other top six ECAC teams (Quinnipiac, Cornell and Union). ►The Northeasternhockeyblog.com has posted a series of detailed opponent season previews with the latest one taking a look at the 2017-18 Terriers. 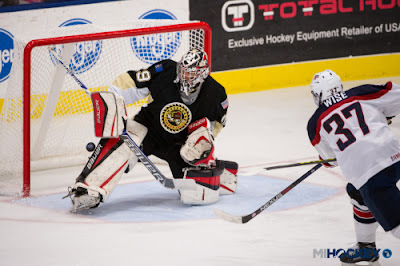 ►The Hockey News’ Ryan Lambert reviews the top 20 performers at last week’s All-American Prospects Game, including Player of the Game Brady Tkachuk and 2018 recruits Joel Farabee and Jake Wise (photo). ►The NCAA has made no new rules changes for the 2017-18 hockey season, but has added several new Points of Emphasis, which are described in this video. A video feature on the NTDP U18s’ 7-6 shootout win against Muskegon includes Farabee’s shorthanded goal and his shootout game-winner. SB Nation reviewed the performance of the NTDP U17s at the NAHL Showcase in Blaine, Minnesota, including 2019 recruits Alex Vlasic (2G,3A in three games), Trevor Zegras (2G, 2A) and Case McCarthy (photo #77). "He's a gamer. That's what I like. He's a smart player, a guy that's going to go out there, find a way to make a play, find a way to make a difference. He's reliable when he needs to be but recognizes opportunities to make something happen and jumps on it." Charlie McAvoy assisted on a power play goal in the Bruins’ 4-2 win against Chicago. Matt Nieto scored his first pre-season goal on an odd-man rush as the Avalanche doubled up Dallas, 4-2.